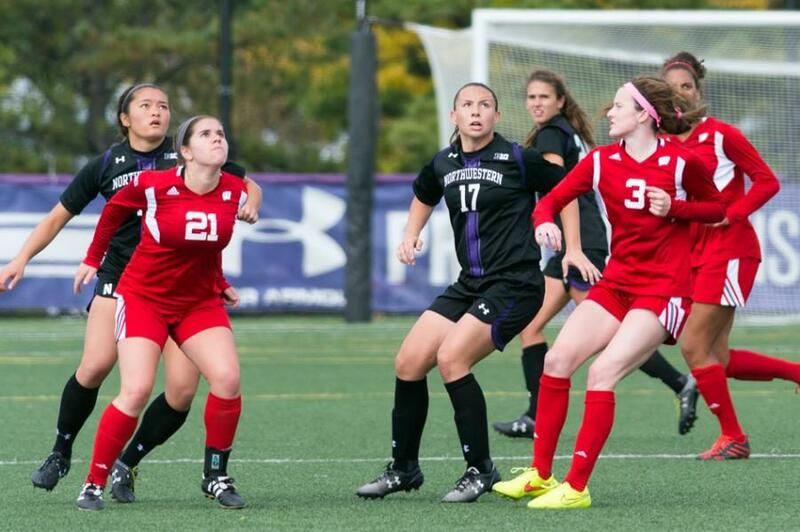 Northwestern players position themselves to win a header. The Wildcats’ defense will have its hands full with a Wolverines offense that has scored 10 of its 30 goals this season on corner kicks. As it stands, the Wildcats won’t have to leave Evanston for the rest of the season, but the team is trying to change that with a late playoff push in the final three regular-season games. The homestand begins Friday, when the Cats (6-7-3, 2-6-2 Big Ten) take on Michigan at Lakeside Field and continues Sunday when they face Michigan State. The Wolverines (11-4-1, 7-2-1) aren’t currently ranked nationally but have received votes for seven weeks this season. The Spartans of Michigan State (9-6-1, 3-6-1) currently sit 10th in the Big Ten standings. With the Cats 12th, this is a game that may give them the opportunity to help themselves move up closer to the eighth seed, which would earn them a bid to the conference tournament. Either way, both games are must-wins for the Cats. Michigan is coming off of a 1-0 loss against Penn State and a 2-2 tie against Ohio State. The Cats fell to both teams earlier this season, 4-1 to Penn State and 3-1 to Ohio State. Like the Cats, the Wolverines have consistently outshot their opponents, posting a 100-71 advantage in shots on goal. The Wolverines, however, are converting at a better rate than the Cats, one of the main reasons the team has won more games this year. Another thing to pay close attention to is set-piece defense. The Wolverines have been active on corner kicks this season, creating 28 more opportunities than their opponents. The team has also converted 10 of its 30 goals on the season following corners. Finally, Michigan has come up huge in clutch situations this year. During a two week stretch in September, the Wolverines won three straight home games with goals in the final 30 seconds of regulation or overtime. With the Cats coming off of two overtime finishes, it will be interesting to see which team will show up in big moments. Michigan State is also coming off games against Penn State and Ohio State, falling to the Nittany Lions 2-1 and beating the Buckeyes by the same score. The big story for the Spartans is true freshman Jamie Cheslik, who has scored 8 goals on the season. She also ranks 7th in the Big Ten in points with 20, just ahead of Cats star Addie Steiner, who has 19. The game also features two top goalies in the Big Ten, who happen to be cousins. Michigan State’s goalie Courtney Clem seems to share more than just a last name with NU’s freshman goalie Lauren Clem. Both Courtney and Lauren rank in the top five in the conference saves with Courtney firmly in first, saving over 20 more than the next best player. The Cats will have to carry over the positive momentum, clutch play and a little bit of luck from last weekend, when the team upset No. 14 Rutgers, to beat the Wolverines and Spartans and set up a possible season-saving game next week against Minnesota. Correction: A previous version of this article misstated the relationship between Northwestern goalkeeper Lauren Clem and Michigan State goalkeeper Courtney Clem. They are cousins. The article also misstated Lauren Clem’s school. She attends Michigan State. The Daily regrets the errors.